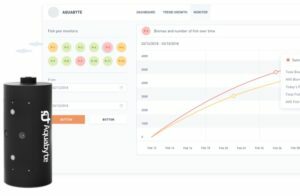 Aquabyte, a startup applying computer vision and machine learning models to dramatically optimize fish farming efficiency, today announced a $3.5 Million Seed Round of funding co-led by Costanoa Ventures and New Enterprise Associates (NEA) with participation from Princeton University and other strategic US and Norwegian investors. Fish farming is the fastest growing sector of food production in the world with more fish being farmed than beef, representing nearly $160B in yearly production. The industry is rapidly expanding, with experts anticipating that protein consumption will increase world-wide by at least 50 percent by 2050. One of the largest challenges in filling the gap between current supply and projected demand is driving down the cost of feed, which currently represents 50 percentof the cost of fish farming. Aquabyte’s technology will augment the visual IQ of human-operated systems by collecting data with underwater 3D cameras. By installing these cameras in fish farm pens, the technology watches the fish and determines the size of fish/biomass in order to determine the optimal feed quantity. Through the application of its machine learning algorithms, Aquabyte anticipates that this more efficient feeding over a fish’s lifetime could result in as much as a 20 to 30 percent decrease in feed cost, which would be tens of billions of dollars saved. Aquabyte is also working on other applications, such as sea lice counting, which accounts for $1 billion in damages in Norway, the largest salmon fish farming country in the world. Built in Silicon Valley, Aquabyte is first being deployed in Norway. The Company received assistance in establishing its business in the country from Norway’s NCE Seafood Innovation cluster. Through this partnership, Aquabyte has set up a number of pilots at local research institutions and farms with sites around the country powered by a team in San Francisco and Bergen, Norway. February 6, 2018 in News, Research, Technology.